On the hill behind our house, there’s a tree that was blown down in the gales earlier this year. It lies splayed on its side, the fall of branches creating a small hollow, roofed over with leaves and sky - as seen in these photos. Over the Easter weekend, my mum and I took out half an hour to walk and to explore so I could clamber all over it, digging my toes into the bark. I’m entranced by dens. Always have been. There’s something almost primal in the idea – hitting that very basic human need for shelter, but with the added bonus of whimsy and imagination. It’s an immensely pleasing pastime, the construction of a space for temporary living, adventuring or escaping. When I was a child one of my favourite activities was to push our two tatty blue sofas close enough together that a sheet could be suspended between them – forming a big, shadowy cave beneath. I’d fill it with cushions and books and listen happily to cassette tapes in the semi darkness. Others were more elaborate. My brother and I made Heath Robinson-esque creations assembled from folding laundry racks, towels, blankets, clothes pegs, chairs, string and elastic bands. I once just slept under the table in my room, draping a blanket over, dragging pillows inside and turning it into a nook to curl up in. Outside, the possibilities extended further. Many a shelter was made with branched walls and moss for insulation, some of them more successfully put together than others. Up in trees, hidden inside bushes, leaning up against trunks – so many options. One recurring location was a patch of land near a friend's house, accessible only by skirting a wall of nettles and jumping over a brook. We claimed it as our own. We’d sweep away the grubs, lay down dock leaf ‘carpets’, allocate various areas as larder, kitchen, dining room (we were very food oriented), then play at being orphans on the run from the authorities. What all these endeavours had in common was the desire to carve out somewhere of our own. I guess it’s the same driving force behind any kind of activity involving tents, yurts and caravans; that chance to claim a space – whether it be for half an hour or several days. It’s a means of stepping outside of the responsibilities and challenges of day-to-day living; boundaries lifted for a little while. Not so much a room of one’s own, but a den of one’s own. 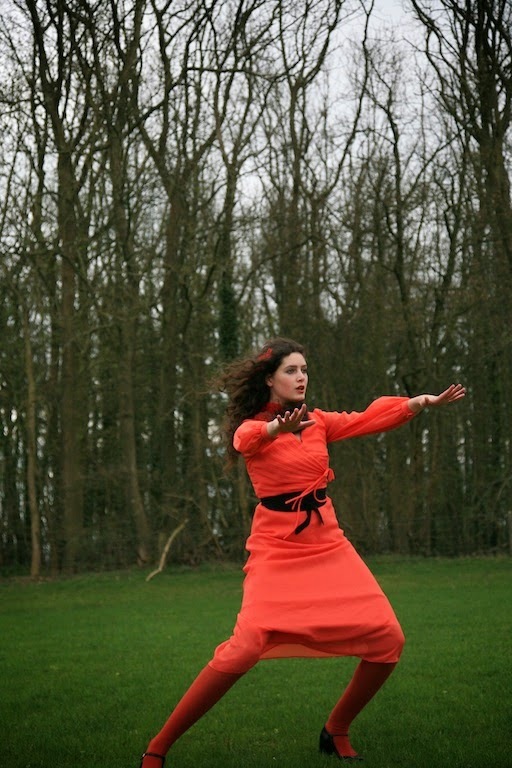 The orange silk dress is a gorgeous Fenn Wright Manson number - given to me by my Fairy Godmother last Christmas. The intensity of the colour combined with the lightness of fabric makes it perfectly suited to floating about in - particularly in bare feet. The vintage belt used to belong to my grandma, the necklace is vintage and the bag is second hand. Dens have cropped up on my blog a few times before, most notably in the following posts: Outside Over There (first photo), These Are a Few of my Favourite Things (included on the list of favourite outdoor activities), Taffeta - A Photo Story, Dressed Up for Den Making and Den Making on a Sunday Afternoon. Before reading this, you might take a moment to look down at your clothes. What are you wearing today? 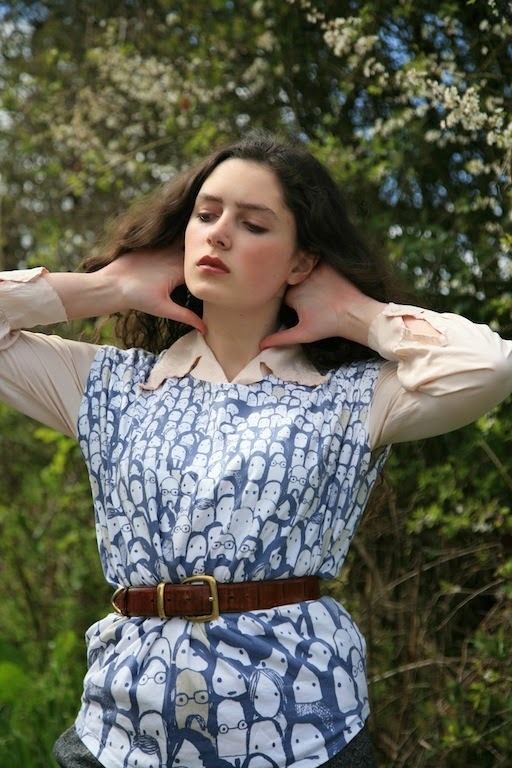 Of course, many fellow bloggers may be following Bella of Citizen Rosebud in having made a pledge to ‘Shop Secondhand First’, or could be wearing vintage, hand-made, up-cycled or hand-me-down. But what about any ‘new’ items? Where are they from? Does the label state which country they were produced in – let alone who might have stitched the seams? These are the kind of questions currently being encouraged by the ‘Who Made Your Clothes?’ initiative, part of the Fashion Revolution day taking place tomorrow, April 24th – the one year anniversary of the Rana Plaza factory collapse. This global event is, as far as I know, the biggest push yet towards raising awareness of fashion industry ethics. Coverage already stretches from Vogue to The Guardian, while individuals including Caryn Franklin, VV Brown, Melanie Rickey, Mary Portas and many others have lent their support. The questions posed by ‘Who Made Your Clothes?’ aren’t new – ‘Who Made Your Pants?’ (see my post on Becky and her business here) have been asking this question since 2008, and then answering with labels on their gorgeous knickers that detail exactly who pieced and stitched them together. But it’s great to see “Who Made…?” being taken up as a wider slogan. It neatly captures the difficulty faced by consumers who want to find out anything about the conditions in which their clothes were made, from factory standards to worker treatment. The most one might get from a label is a country – ‘Bangladesh’, quite possibly, or any of the other countries Western mega-brands rely on to give them fast turnarounds and low-cost labour. How to find out more? It’s nigh on impossible with long, tangled strings of supply chains and middle managers and audits that often don’t tell us very much. This is why the Fashion Revolution team are asking for as many people as possible to contact the brands they love best – to tweet, email, facebook – and to ask ‘who made my clothes?’ Who made those beloved bargain items? Who sewed the beading onto that collar? Whose hands hemmed this skirt? Whose fingers added those buttons? They are also encouraging individuals to wear a favourite item inside out so that the label is on show. Alongside an active social media presence on the day, there are a variety of exciting talks, events, second hand bonanzas and other great things going on. Let’s hope it proves to be the cue needed to continue and to consolidate a very serious dialogue. Change has to come from both ends, from buyers and brands alike. Consumers have to prove that we care enough to be vocal about how our clothes are made. Labels and brands have a responsibility to listen, and to implement change where they can – change with lasting impact, rather than the introduction of ethics policies with less substance than a polyester crop top. 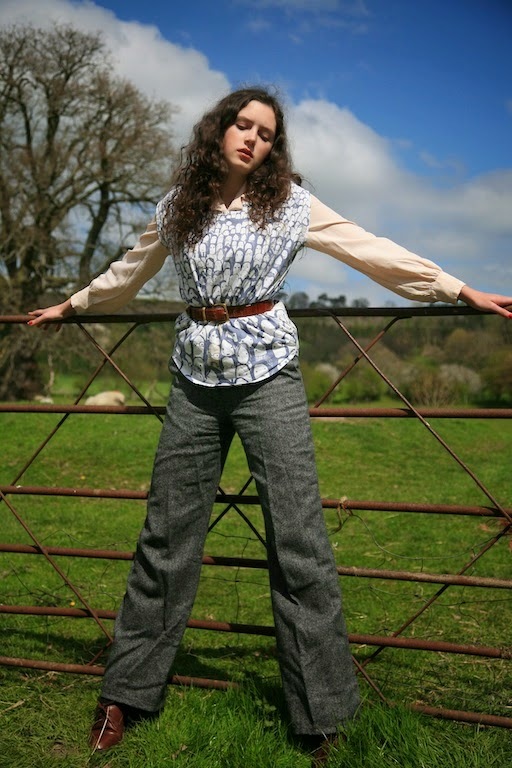 Sustainable style is something I’ve written and spoken about many times previously. There’s a lot more to say, and plenty of amazing people currently saying it. A lot of very valuable articles and commentaries have come out of the initiative, ranging from Tansy Hoskins' critical analysis to Bethan Holt's piece for The Debrief (in which I'm quoted). Below is a brief list of links to various pieces of writing of my own and features from the last few years. On Thurs 24th April I’ll be supporting and cheering on the Fashion Revolution initiatives, while also thinking about the families of all those who lost their lives in Rana Plaza 12 months ago. 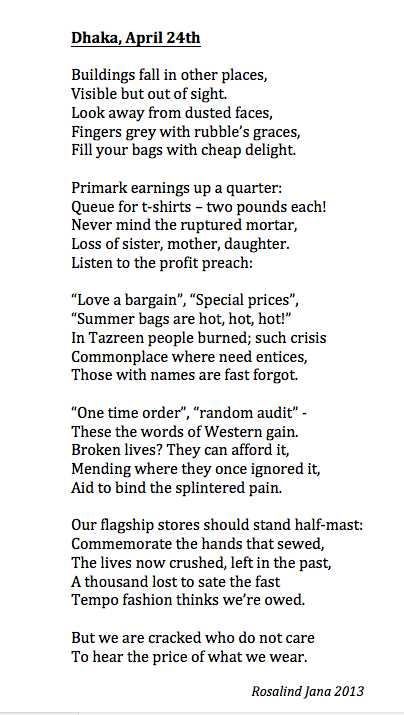 This is the poem I wrote last year in the aftermath of the Dhaka tragedy. Happy Fashion Revolution day. Let’s make it an inquisitive one. Well, I certainly know who made my top - this People Tree top came with a little label detailing its manufacture when I bought it last year. 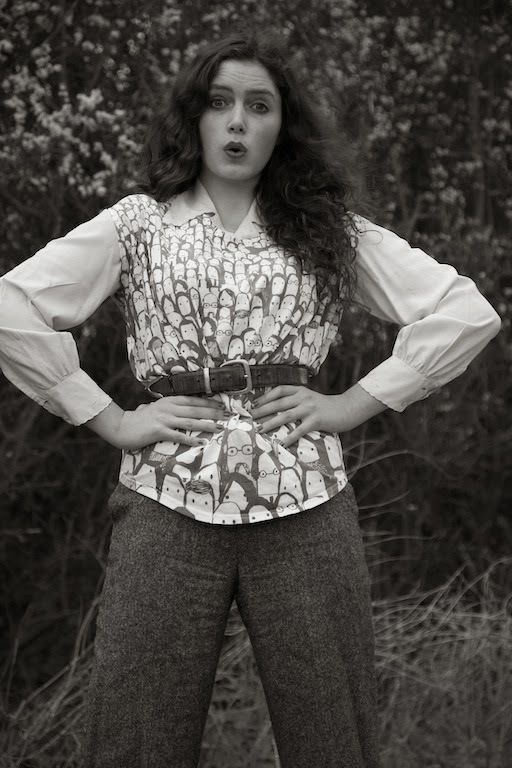 I had fun styling the cartoon faces with a vintage silk blouse, second hand (charity shop) trousers and a belt stolen from my mum - who bought it from a charity shop. And I should mention that, although hidden beneath other layers, I was rather appropriately wearing a pair of black lace knickers by Who Made Your Pants. That final sentence is a shortened version of my screeching as I managed to secure tickets for my parents and me. We were immensely fortunate. Twitter (that general arbiter of public consensus) was divided between celebrations and lamentations. It was quite incredible to see the explosion surrounding that first announcement. Suddenly everyone was a Kate Bush fan – with one or two in between the cacophony cleverly saying, “Oh, well I don’t really get the fuss.” She made headlines; old pictures dusted off to appear in print once more. Columns were filed and set-list predictions made. The brilliant 'Never Underdressed' even devoted a feature to her most memorable fashion choices. Dismissing the scummy ticket touts, it would be interesting to know the varying motives behind those who rushed to secure concert places: nostalgia for the time when she was a fresh young thing? Final fulfilment for missing out on the1979 tour? An avid love for all things Kate? A younger generation - myself included - with our second hand vinyl and Hounds of Love on repeat in iTunes, keen to hear her live? Dare I say, for some, merely the desire to be able to say that they’ve seen her in the flesh – that they were there? Part of the thrill of the entire thing rests in Kate Bush’s complete refusal of celebrity. We know little about her, beyond those mesmerizing songs. She was, and is, primarily a visual and vocal presence. Accessible through photographs, music videos and albums (as well as the occasional interview or documentary), our perception is informed by the clarity of her art and image, rather than her personal life. 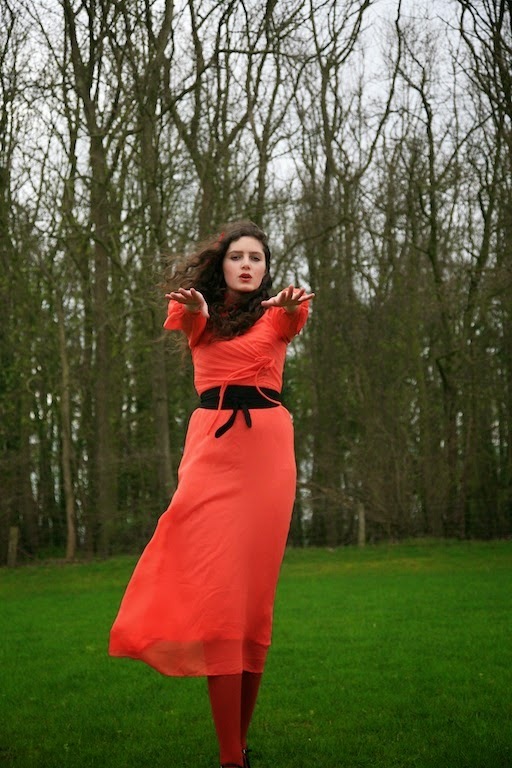 ‘Kate Bush’ as an entity is composed from that Wuthering Heights dance; those heavily outlined eyes in Army Dreamers; an array of outfits from leotards to long dresses; the kaleidoscope effect; soft focus videos later replaced with unfolding narratives – all topped off with a fuzz of big hair, outlandish facial expressions and a swooping voice. We can chart her progress from ethereal sprite to sensual woman as the albums go by. Yet perhaps to label her as such, to suggest a clear movement from one to the other, is to limit her. Her videos yield multiple personas: of witch, warrior, schoolboy, theatre luvvie, woodland princess, dancer, explorer, bank robber, spurned wife, queen. And those are just a handful of the more easily recognisable characters. Try adjectives instead: witchy, weird, sensuous, playful, strong, fragile, feminine, androgynous, confident, athletic, otherworldly. All fit. It’s that constant innovation and intelligence I adore. The keen creativity. The theatricality and continual reinvention. The songs that reach the nerves. Her voice has accompanied hours of dancing, jogging, fashion shoots, essay writing, surgery recovery, train journeys, sketching and evenings fuelled by friends, wine and conversation. She’s also one of the few artists I return to again and again for inspiration – be it for her fantastical dress sense, her sharp work ethic, her bold videos, unashamed individuality or just a bloody wonderful album. When I was five, I’d raid the dressing up trunk and then spin around the living room to 'The Red Shoes'. Some thirteen years later, I’m now raiding my own wardrobe and spinning from place to place. And come September I’ll be raiding my most outrageous finery and spinning off to the Hammersmith Apollo. Who knows what we’ll see and hear there – but I’m sure it will be spectacular. Need I explain the outfit? 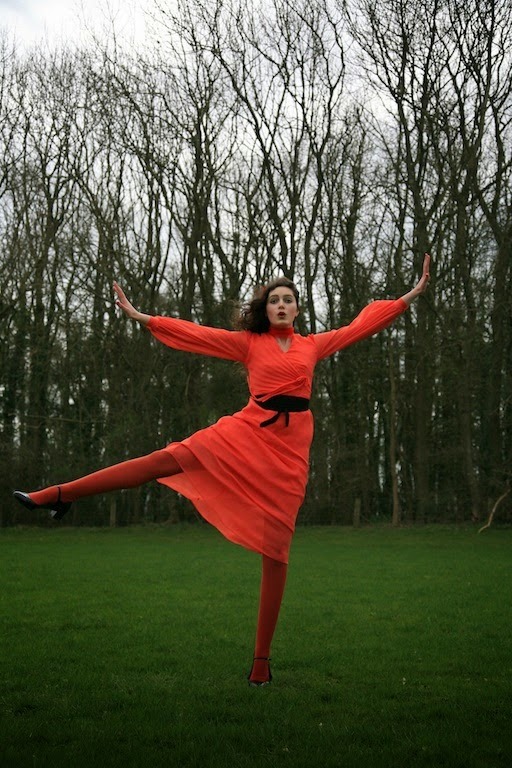 My homage to the (in)famous Kate Bush Wuthering Heights video (blurry still image below) was completed with a seventies dress from a vintage shop in Edinburgh, second hand accessories and shoes from Marks & Spencer. I managed to raise eyebrows from passing cars and had great fun leaping around the chilly, windy field. 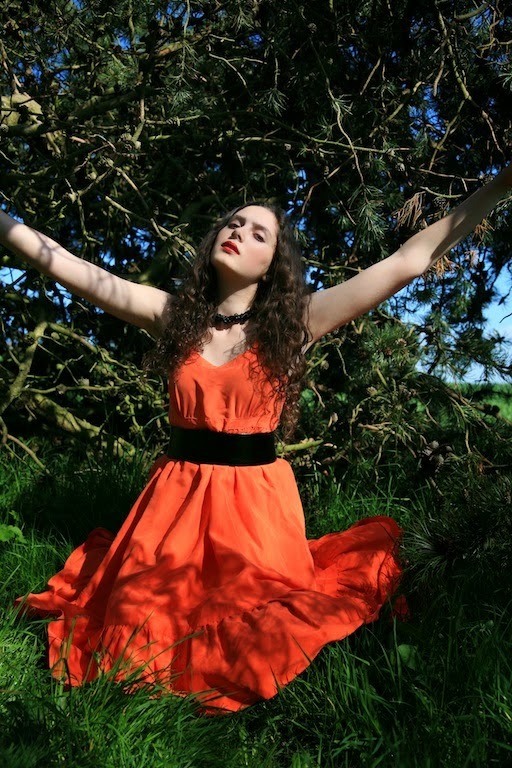 You can see a previous Kate Bush inspired shoot that I photographed with the gorgeous Evangeline Ling here.